James Wilby capped a stunning first day for Team England at the Commonwealth Games by taking a gold medal in the men’s 200m Breaststroke final. Wilby was seventh with 100m to go and third heading into the last 50m but stormed through to touch home in 2:08.05, 0.27 seconds ahead of Scotland’s defending champion Ross Murdoch. It sealed Team England’s fourth gold medal of the day after success for Aimee Willmott, Tom Hamer and Ellie Robinson. It’s the first time in 24 years that England has won the Commonwealth Games gold medal in the 200m Breaststroke. Nick Gillingham was the last to claim the title in 1994 in Victoria. Wilby was thrilled to have won his first Commonwealth Games individual title. He said: “I smashed it and to do it at a competition like this is a huge, huge relief. I’m sure it will settle in but there are more races to go. “Ross is a great guy and a great friend. The competition for breaststroke in Britain is incredible. We all get on really well and we thrive off each other. How fast you swim pushes each other along. “I had a bit of an upset for me in Budapest last year but as soon as I was back in the pool I said to my coach that’s gone, we can’t change it, let’s move on and let’s put what went wrong right. This is the first confirmation of the work we have been doing. 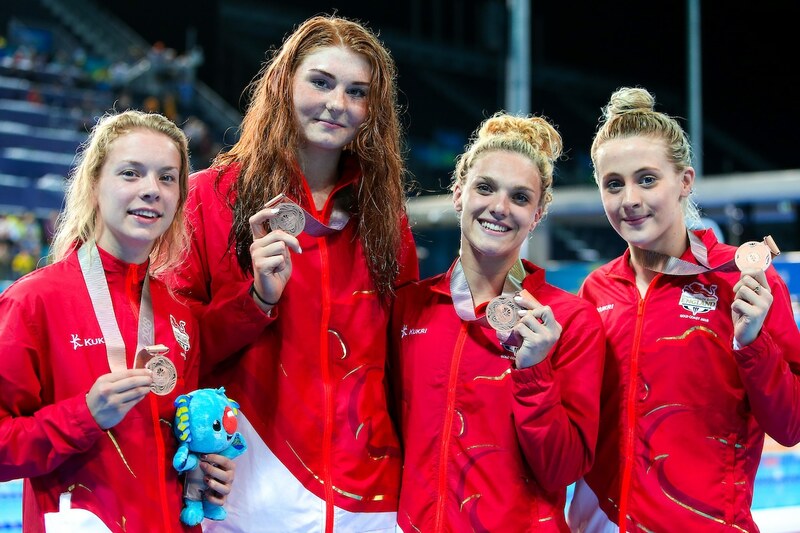 In the final race of the day, Team England claimed a bronze medal in the women’s 4x100m Freestyle relay. Australia took the title in front of a packed crowd at the Optus Aquatic Arena in a world-record time of 3:30.05. Canada took the silver in 3:33.92 while England’s team of Siobhan-Marie O’Connor (54.34), Freya Anderson (54.95), Anna Hopkin (53.82) and Ellie Faulkner (55.29) clocked 3:38.40 to comfortably take bronze. O’Connor, who swim the first leg, said: “We knew the Aussies had such a strong team and it was amazing to be in there with them. “We’re really proud of our performance and getting a medal on the first day is a great start to the week. Sarah Vasey – a sprint breaststroker who trains with Adam Peaty in Mel Marshall’s group at Loughborough National Centre – closed in on the medals in the 50m Breaststroke. The 21-year old booked her spot in the final with a 30.75 effort in the semis, trailing only Jamaica’s Alia Atkinson (30.53). Another swimmer from Marshall’s group, Luke Greenbank, also booked a final berth in the 100m Backstroke. Greenbank lowered his personal best to 54.54, touching second in his semi final and fifth fastest overall. Finally, Poole’s Jacob Peters will line up in tomorrow’s 50m Butterfly final after progressing seventh fastest from the semis in a British 17 yrs age group record 24.05.